It's that bling bling bay-bay! Did you look at it? Go ahead and look at that shine! 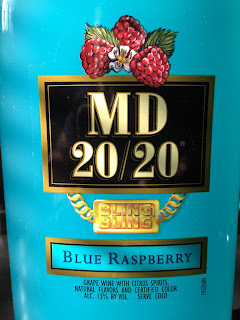 I previously inducted MD 20/20 Blue Raspberry as the Bum Wine Of The Week back in 2014, but I felt it was time we gave this fan favorite a second go around since it is a favorite of Chelsea La Vone, who will be joining me on this weeks edition of Bumming with Bobcat! 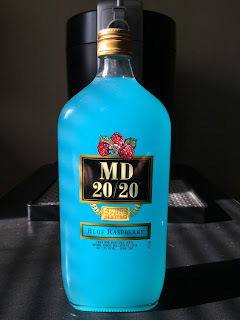 What can I say about MD 20/20 Blue Raspberry that hasn't been said before? First off, the bottle has a gold chain that says "bling bling" on it. That right there is enough for you to make the correct decision about this purchase. It doesn't hurt that the bling bling is delicious as well. I think most people would rank this towards the top of the best flavor list in their bum wine rankings. Like most of the other flavors of MD 20/20, the Blue Raspberry comes in at 13% ALC/VOL and can get the job done. Be sure to grab yourself a bottle of the "Bling Bling" MD 20/20 Blue Raspberry, the BWB Bum Wine Of The Week! Tune in LIVE this Sunday at 11pm ET when I am happy to welcome the talented Chelsea La Vone to the bumcast! Chelsea is an award winning shock illusionist showgirl, feature entertainer, and Suicide Siren that has been performing on stage, television, and film for over 10 years. We will also have the latest updates on the BWB NFL Pick 'Em League, the Podcast Fantasy Showdown League, plus much MORE on this weeks episode! Tell your friends to tune in and join the party. Cheers!